Elesa vibration-damping elements are manufactured with natural rubber combined with zinc-plated steel or AISI 304 stainless steel threaded inserts. Elesa damping elements are available in a wide range of dimensions and shapes. 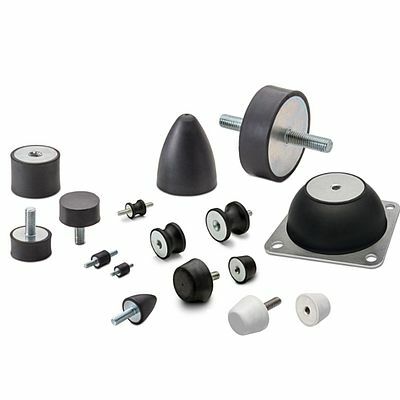 In addition to the already well-known series with cylindrical (DVA.1, DVA.2, DVA.3 – DVA.4, DVA.5) or parabolic shape (DVA.6, DVA.7), Elesa has recently introduced DVB.6 and DVB.7 rubber bushes with conical shape, which are generally used as bumpers or limit stops. New DVC.1, DVC.2, DVC.3 vibration-damping elements with bobbin shape allow, under pressure, more lateral movement as well as vertical dampening. Elesa offers DVE series bell-shaped mounts, composed of two metallic elements joined together by a rubber body. Elesa new damping elements DVF.6 and DVF.7 with conical shape in silicon rubber, grey colour, FDA compliant, makes them particularly suitable for applications in food processing industry and medical environments.